World Mental Health Day, celebrated on 10th of October every year, is a day that promotes awareness and understanding for those suffering from mental illness or those who know people who are. 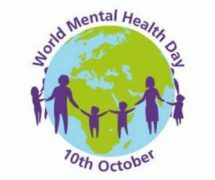 Mental illness is a very important issue in this day and age, where mental illnesses and those who suffer with them are rising in number in year as issues and illness are being diagnosed more commonly rather than being ignored or missed. Approximately 11% of people in Wales are currently being treated for mental illnesses, according to the Welsh Health Survey of 2012, which means that you could know someone who suffers from a mental illness. New Horizons invite you to their open day at New Horizons, Appletree Stores Dinas, Rhondda. Find out what support is on offer from 1pm to 4pm. “Walk For Health and Wellbeing” event in Ynysyngharad Park, Pontypridd, meeting at the park’s main entrance on Bridge Street to start the walk at 10.30am.